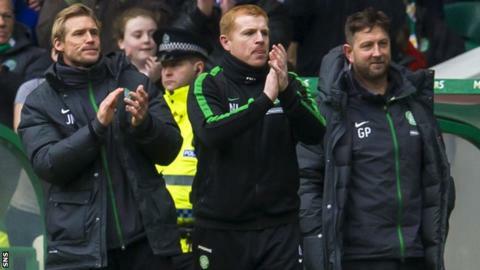 Celtic assistant manager Johan Mjallby will leave the Scottish Premiership champions at the end of the season. The Swede, who became Neil Lennon's assistant in 2010, wants to "seek some different opportunities". Lennon told the Celtic website he would be "very sad" to see his former team-mate leave the club. And Mjallby, 43, added: "I have enormous affection for Celtic Football Club and it is with sadness that the time to leave has arrived." The club will now begin the process of appointing a replacement. Defender Mjallby, who won 49 Sweden caps, joined Celtic as a player in 1998 and won three Scottish Premier League titles with the club before his departure in 2004. He also served AIK and Levante before being appointed by Lennon in 2010, joining Garry Parker in the manager's backroom team and going on to help the club win three top-flight titles. "The club has been part of my life for almost two decades and I have been dedicated to them in every way, first of all as a player and then in management," Mjallby said. "As a player, it was a time when we achieved great success and I had the privilege to work with football people and players who were first-class and real quality. We had some great moments and memories I will always cherish. "It was an honour to return to the club and work in management with Neil, Garry and the players, and we have worked hard over the last few years to once again bring the club success. "I hope Neil, the staff and the players can deliver many more trophies and titles for our fans in the future. I would like to sincerely thank all our supporters for all they have given me and everything they have given to the club. They are special fans, the best I have ever seen in football." Lennon paid tribute to Mjallby's "great service". "He will always be a big part of Celtic," added the manager. "When I was given the chance to be in charge of the team, Johan was the obvious choice to join me in tackling the challenges ahead and from day one, he has been a very important part of our success. "I know whatever challenge Johan chooses next, he will be a great success and I wish him and his family nothing but good fortune for the future."